Malawi Congress Party (MCP) presidential candidate Lazarus Chakwera yesterday dismissed the governing Democratic Progressive Party (DPP) manifesto as empty and self-contradictory. But reacting to Chakwera’s sentiments in an interview last evening, DPP spokesperson Nicholas Dausi said DPP’s manifesto is not empty, but “the one who said so is empty”. Chakwera expressed his sentiments during a campaign rally he addressed at Nkhotakota LEA School ground. In his address, he accused the DPP administration of failing to deliver on its 2014 manifesto promises; hence, the party should be voted out. Said Chakwera: “Malawians have suffered in the last five years because of this administration. There is no reason to vote them again into power for another five years. He argued that the DPP manifesto falls short of giving details in terms of fighting corruption or instilling fiscal discipline in the management of public funds. Chakwera, who was leader of opposition in Parliament between 2014 and February this year when he resigned with a month to the end of his tenure to pave the way for his presidential bid, promised that once ushered into power, an MCP administration will revamp the agriculture sector and improve health systems. In his remarks, MCP secretary general Eisenhower Mkaka said his party was ready to transform the country through programmes it has outlined in its manifesto aimed at uplifting lives of the rural masses. He cited the proposal to introduce a universal fertiliser subsidy as opposed to the current targeted Farm Input Subsidy Programme (Fisp) to enable the poor and vulnerable people buy fertiliser and hybrid seeds at lower prices. Before the rally, Chakwera attended a Palm Sunday service at Dwangwa Anglican Church where he asked the congregants to seek God’s guidance in the forthcoming elections. He said the country needs a God-fearing visionary leader. In the May 20 2014 Tripartite Elections, MCP and DPP won two seats each with one going to an independent. In 2009, DPP also won two of the five seats in Nkhotakota while MCP had one and independents had two. 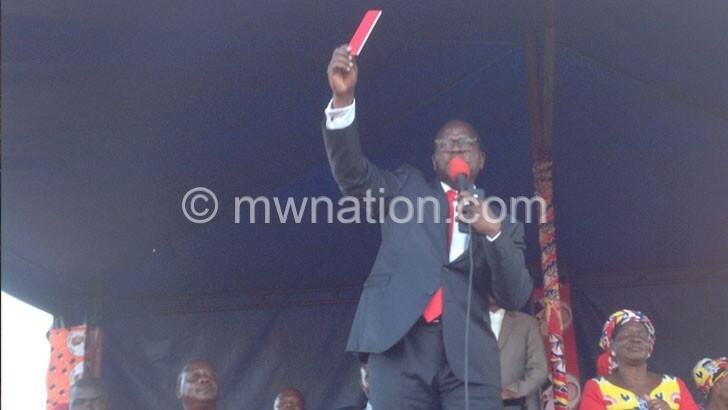 The post MCP quashes DPP manifesto appeared first on The Nation Online.